John Porter Sr. married Anna White, daughter of Robert White and Bridget Allgar, in 1620 at Shalford, Co. Essex, England. Child of John Porter Sr.
[S52] Henry R. Stiles History of Ancient Windsor II, Vol. II:Pg. 620. Samuel Grant Jr. was born on 20 April 1659 at Windsor, Hartford Co., CT. He was the son of Samuel Grant and Mary Porter. Samuel Grant Jr. married Anna Filley, daughter of Samuel Filley and Anna Gillet, on 6 December 1683 at Windsor, Hartford Co., CT. Samuel Grant Jr. married Grace Minor, daughter of John Miner and Elizabeth Booth, on 11 April 1688 at Windsor, Hartford Co., CT. Samuel Grant Jr. died on 8 May 1710 at age 51. [S95] Gary Boyd Roberts, Presidents 1995 Edition, Page 37/Item 32. Anna Filley was born on 16 August 1664 at Windsor, Hartford Co., CT. She was the daughter of Samuel Filley and Anna Gillet. Anna Filley married Samuel Grant Jr., son of Samuel Grant and Mary Porter, on 6 December 1683 at Windsor, Hartford Co., CT. Anna Filley died on 18 April 1686 at age 21. Child of Anna Filley and Samuel Grant Jr.
Grace Minor was born on 20 September 1670 at Stratford, CT. She was the daughter of John Miner and Elizabeth Booth. Grace Minor married Samuel Grant Jr., son of Samuel Grant and Mary Porter, on 11 April 1688 at Windsor, Hartford Co., CT. Grace Minor died on 16 April 1753 at age 82. Children of Grace Minor and Samuel Grant Jr.
[S676] Gary Boyd Roberts, Presidents 2009 Edition, page 55. Noah Grant was born on 11 December 1693 at Windsor, Hartford Co., CT. He was the son of Samuel Grant Jr. and Grace Minor. Noah Grant married Martha Huntington, daughter of John Huntington and Abigail Lathrop, on 12 June 1717 at Tolland, CT. Noah Grant died on 10 October 1727 at Tolland, CT, at age 33. [S52] Henry R. Stiles History of Ancient Windsor II, Vol.II:Page 306, 310. [S95] Gary Boyd Roberts, Presidents 1995 Edition, Page 37/Item 16. Martha Huntington was born on 6 December 1696 at Norwich, CT. She was the daughter of John Huntington and Abigail Lathrop. Martha Huntington married Noah Grant, son of Samuel Grant Jr. and Grace Minor, on 12 June 1717 at Tolland, CT. Martha Huntington married Peter Buell, son of Samuel Buell and Deborah Griswold, on 7 January 1729 at Coventry, Hartford (now Tolland) Co., CT.1 Martha Huntington died on 26 August 1779 at Tolland, CT, at age 82. Peter Buell was born on 3 December 1684 at Killingworth, New London (now Middlesex) Co., CT.2 He was the son of Samuel Buell and Deborah Griswold. Peter Buell married Hannah Welles, daughter of Capt. Samuel Wells and Ruth Rice, on 8 October 1713 at Coventry, Hartford (now Tolland) Co., CT.2 Peter Buell married Martha Huntington, daughter of John Huntington and Abigail Lathrop, on 7 January 1729 at Coventry, Hartford (now Tolland) Co., CT.2 Peter Buell died in March 1769 at Coventry, Tolland Co., CT, at age 84. The wills of Hannah's parents show that she had children Samuel and Hannah. Noah Grant Jr. was born on 12 July 1718 at Tolland, CT. He was the son of Noah Grant and Martha Huntington. Noah Grant Jr. married Susanna Delano on 5 November 1746. Noah Grant Jr. died on 20 September 1756 at Killed on Scouting Party, Ft. William Henry, at age 38. [S52] Henry R. Stiles History of Ancient Windsor II, Vol. II:Pg. 310. [S95] Gary Boyd Roberts, Presidents 1995 Edition, Page 37/Item 8. Susanna Delano was born on 23 June 1724 at Tolland, CT. She married Noah Grant Jr., son of Noah Grant and Martha Huntington, on 5 November 1746. Susanna Delano died on 16 August 1806 at Coventry, Tolland Co., CT, at age 82. Child of Susanna Delano and Noah Grant Jr.
Noah Grant III was born on 20 June 1748 at Tolland, CT. He was the son of Noah Grant Jr. and Susanna Delano. Noah Grant III married Ann Buell, daughter of Abel Buell and Mehitable Dewey, in 1777.3 Noah Grant III married Rachel Kelly on 4 March 1792 at Greensburg, PA. Noah Grant III died on 14 February 1819 at Maysville, KY, at age 70. Noah responded to the Lexington Alarm April 1775, then age 27, as a Lieut. of militia; upon the organization of the Continental Army at Cambridge, Mass., in July of that year, he was appointed Lieut in the Continental Army; served actively during the whole Revolutionary War, ending with the commission of captain; he moved in 1790, to Westmoreland Co., Pa., settling near Greensburgh on the Monongahela river, 20 miles above Pittsburgh; with second wife moved in April 1799, to the Northwest Terrritory, and settled at Fawcettstown, now Liverpool, Columbiana Co., Ohio, 45 miles below Pittsburgh, Pa, and 2 miles below the line of Pennsylvania. Again, in 1804, they moved 40 miles to the present town of Deerfield, Portage Co., OH, where Rachel died 10 april 1805, leaving the old soldier with a large family and but scanty means of support. The family was broken up and scattered. In 1811 he moved to Maysville, Ky, and died there in the family of his son Peter, 14 Feb, 1819, age 72. [S52] Henry R. Stiles History of Ancient Windsor II, Vol.II:Pg.317, Item 234 and Pg. 325, Item 234. [S95] Gary Boyd Roberts, Presidents 1995 Edition, Page 37/Item 4. Rachel Kelly married Noah Grant III, son of Noah Grant Jr. and Susanna Delano, on 4 March 1792 at Greensburg, PA. Rachel Kelly died on 10 April 1805 at Deerfield (Maysville), OH. Hannah and Jesse were married at the Simpson homestead, Bantam, Ohio, by the Rev. Moses Edwards. Jesse Root Grant was born on 23 January 1794 at Westmoreland Co., PA. He was the son of Noah Grant III and Rachel Kelly. Jesse Root Grant married Hannah Simpson, daughter of John Simpson Jr. and Rebecca Weir, on 24 June 1821 at Point Pleasant, OH. Jesse Root Grant died on 29 June 1873 at Covington, KY, at age 79. [S52] Henry R. Stiles History of Ancient Windsor II, Vol.II:Pg. 326, 335. [S95] Gary Boyd Roberts, Presidents 1995 Edition, Page 37/Item 2. Hannah Simpson was born on 23 November 1798 at Horsham, PA. She was the daughter of John Simpson Jr. and Rebecca Weir. Hannah Simpson married Jesse Root Grant, son of Noah Grant III and Rachel Kelly, on 24 June 1821 at Point Pleasant, OH. Hannah Simpson died on 11 May 1883 at Jersey City, NJ, at age 84. 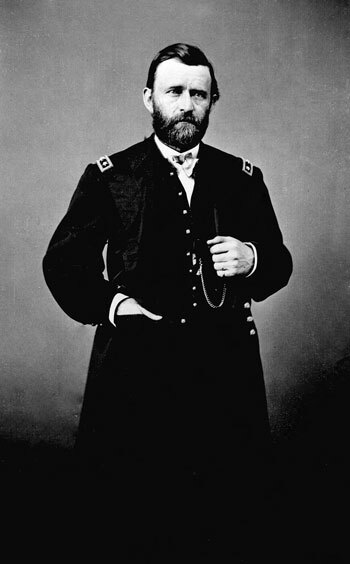 President Ulysses Simpson Grant was also known as Hiram Ulysses Grant. He was born on 27 April 1822 at Point Pleasant, OH. He was the son of Jesse Root Grant and Hannah Simpson. President Ulysses Simpson Grant married Julia Boggs Dent on 22 August 1848 at St. Louis, St. Louis Co., MO. President Ulysses Simpson Grant died on 23 July 1885 at Mount McGregor, NY, at age 63. He was buried on 8 August 1885 at General Grant National Memorial, New York City, NY. Hiram Ulysses Grant was born in a two-room cabin in southwestern Ohio, near the Ohio River. When he was one year old, his father moved the family to nearby Georgetown, where the boy grew up and attended school. He later went to nearby Maysville seminary in Maysville, Kentucky, and Presbyterian Academy in Ripley, Ohio. When he was 17, his father secured his admission to the U.S. Military Academy at West Point through U.S. Congressman Thomas L. Hamer of Ohio. Grant entered West Point in May 1839 and became Ulysses Simpson Grant through Congressman Hamer's error in writing the name. [S52] Henry R. Stiles History of Ancient Windsor II, Vol.II:Pg 335. Julia Boggs Dent was born on 26 January 1826 at St. Louis, St. Louis Co., MO. She married President Ulysses Simpson Grant, son of Jesse Root Grant and Hannah Simpson, on 22 August 1848 at St. Louis, St. Louis Co., MO. Julia Boggs Dent died on 14 December 1902 at Washington, DC, at age 76. Friend Grant was born on 19 September 1740 at Lowell, MA. He was the son of Thomas Grant Capt. and Rachel Buell. Sarah Grant was born on 7 August 1745 at Lowell, MA. She was the daughter of Thomas Grant Capt. and Rachel Buell. Rachel Grant was born on 26 February 1747/48 at Lowell, MA. She was the daughter of Thomas Grant Capt. and Rachel Buell. Ann Grant was the daughter of Thomas Grant Capt. and Rachel Buell. Thomas Grant was born on 26 March 1754 at Lowell, MA. He was the son of Thomas Grant Capt. and Rachel Buell. John Grant was born on 24 April 1664 at Windsor, Hartford Co., CT. He was the son of Samuel Grant and Mary Porter. John Grant married Elizabeth Skinner on 5 June 1690. John Grant died on 19 July 1695 at age 31. Elizabeth Skinner married John Grant, son of Samuel Grant and Mary Porter, on 5 June 1690. Elizabeth Skinner died on 9 October 1707. Matthew Grant was born on 22 September 1666 at Windsor, Hartford Co., CT. He was the son of Samuel Grant and Mary Porter. Matthew Grant married Hannah Chapman, daughter of Edward Chapman and Elizabeth Fox, October, 1690. Matthew Grant died on 9 February 1734 or 1735. [S52] Henry R. Stiles History of Ancient Windsor II, Vol. II:Pg. 307/Item 9. Hannah Chapman was born on 3 May 1671 at Windsor, Hartford Co., CT. She was the daughter of Edward Chapman and Elizabeth Fox. Hannah Chapman married Matthew Grant, son of Samuel Grant and Mary Porter, October, 1690. Hannah Chapman died on 28 December 1752 at age 81. Made freeman in 1667; died of wounds received in the attack on the Narragansett Fort, known as the Swamp Fight. Edward Chapman married Elizabeth Fox. Edward Chapman died on 19 December 1675. Elizabeth Fox married Edward Chapman. Nathaniel Grant was born on 14 April 1672 at Windsor, Hartford Co., CT. He was the son of Samuel Grant and Mary Porter. Nathaniel Grant married Bethia Warner on 12 October 1699. Bethia Warner married Nathaniel Grant, son of Samuel Grant and Mary Porter, on 12 October 1699. Sarah Grant was born on 19 January 1678 or 1679 at Windsor, Hartford Co., CT. She was the daughter of Samuel Grant and Mary Porter. Mercy Buell was born on 20 May 1743 at Simsbury, Hartford Co., CT. She was the daughter of Ephraim Buell Jr. and Mercy Barber. Children of Irania Case and Samuel Buell Jr.
Jonathan Buell was born on 14 February 1741 at Simsbury, Hartford Co., CT.1 He was the son of Samuel Buell Jr. and Irania Case. Abigail Buell was born on 3 August 1743 at Simsbury, Hartford Co., CT. She was the daughter of Samuel Buell Jr. and Irania Case. David Buell was born on 13 June 1747. He was the son of Samuel Buell Jr. and Irania Case. Samuel Buell was born on 4 April 1749. He was the son of Samuel Buell Jr. and Irania Case. Samuel Buell died in 1749. Chloe Buell was born on 16 April 1752 at Simsbury, Hartford Co., CT. She was the daughter of Samuel Buell Jr. and Irania Case. Chloe Buell died in 1752. Samuel Buell III was born on 8 July 1756. He was the son of Samuel Buell Jr. and Irania Case. Samuel Buell III married Hannah Burnham, daughter of Elijah Burnham and Hannah Bidwell. Samuel Buell III died in 1813.